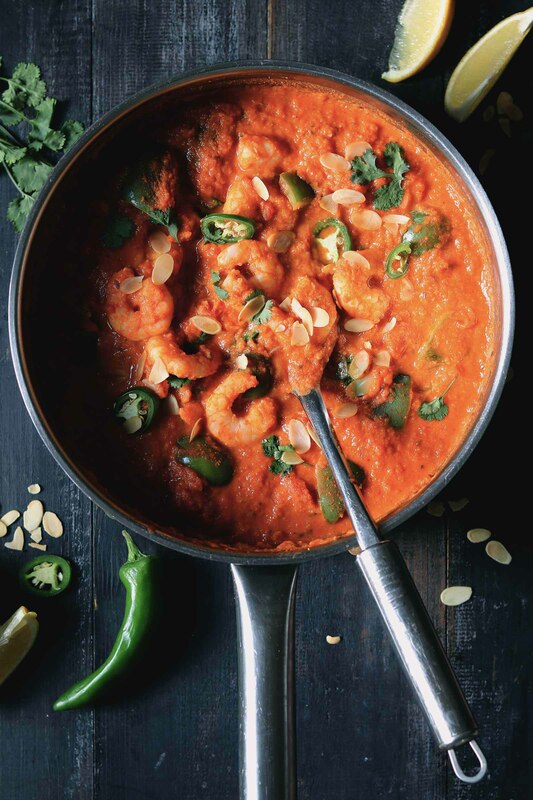 Do yourself a favour this weekend, ditch the take-out and make this prawn curry! Make it for date night or just for you, because this prawn curry is better than any take-out curry I’ve ever had. You may notice from this blog that I have a slight curry addiction, I make all kinds of curries but this one is definitely one of my favourites. It is tried and tested and it has taken me some time to perfect it. I make this for date night as it’s a little too spicy for my girl so the quantities are for two greedy people, but you could easily bulk this up to feed more. This prawn curry with coconut is rich and deeply spiced but not spicy hot. It is Indian inspired but not traditional. I used frozen jumbo king prawns without tails, you don’t want to be faffing about with tails when eating this curry! Also, please make sure your prawns are responsibly sourced. I like a green bell pepper with this curry but you could add more pepper if you like. You could also add some mushrooms too if you fancy it but I like this one as it is. So the spice level is low to medium, the heat grows nicely here, there is no sudden belt of heat. However, if you prefer more of a kick you could add more green chilli. When I tested this curry I used coconut milk the first few times I made it and it always felt a little too watery, this suits some curries but I really felt it wasn’t quite right for this one. I wanted the sauce to be rich and creamy, a little thicker too. So I tried creamed coconut, the hard stuff, this really made a huge difference. Make sure you don’t get the liquid creamed coconut as this also gave a watery consistency. Blending the ingredients in a food processor also made a significant difference as did letting the sauce simmer for a little while. It gives the spices some time to mingle together and blend nicely. I really hope you get a chance to make this curry, we loved it. You could make the sauce base the day before if you have time, but once the prawns are added you really need to eat it straight away. I serve this with basmati or brown rice, a couple of slices of green chilli, coriander leaves, toasted flaked almonds and popadoms. So, we have been packing boxes every day now and this date night curry is the perfect break from organising our move. We have just two weeks left to go now and I can’t wait to get in and start getting ready for Christmas. I just hope it’s not snowing the day we move! I’m also hoping I will get a few more recipes out to you before Christmas but if I don’t you’ll know why! A rich and warming prawn curry with coconut. Perfect for date night. Heat the oil in a large saute pan, add the onion and cook over a medium heat for about 10 minutes, stirring often so it doesn't burn. Add the ginger, garlic and green chilli and cook for about 2 minutes. Then add the cumin seeds, curry powder and tamarind paste, cook until they release their aromas, about 1 minute. Then transfer to a food processor. Add the creamed coconut, 3/4 of the tinned tomatoes and blitz until you have a smooth paste. Return the paste to the pan, add the green bell pepper and cook for 2 minutes. Then add the remaining tomatoes and 100ml of water. Leave to simmer over a low heat for 10 minutes. Turm up the heat to medium then add the prawns and coriander leaves and cook until the prawns are heated through and pink about 5 minutes. Serve with basmati rice, popadoms and toasted almond flakes. Calories are approximate and do not include rice or poppadoms. I never really make curry – this recipe gives me a good reason to do so!! yum! I love a good curry recipe.